Why did you choose a career in special education? While working in the corporate world I became a Christian. As a Christian, I was exposed to different kinds of mission/charity works and part of it was teaching street children: going to orphanages and different provinces in the mountains to teach the tribes living there. I was encouraged by a friend to earn a Masters in Special Education so I can use it as well in the Ministry that I was actively involved in. I also have a sister who has special needs and she was trained to do things like regular children. When I studied I realized that I can be of help not only to my sister but also to those who need help but don’t know where to find it. I gave up my corporate career to become a teacher. Some people did not understand my decision but I wanted to learn more about children with special needs. It’s very rewarding to see your children growing and developing, and knowing that they can learn in their own special way. I spent years teaching and love working with children because I know there’s hope for them despite their difficulties. I go the extra mile by teaching children with special needs life skills to benefit them in our society, and I know it is not an easy journey for my students and me. Being with them have taught me he real meaning of love, that love never fails no matter what challenges I’m going to face. I will be still because they are my pride and they are the ones who gives me joy every time they succeed. 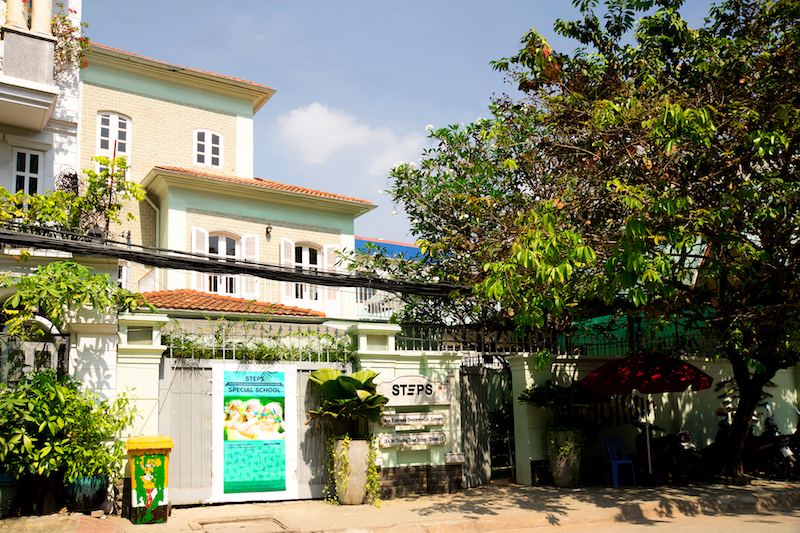 STEPS is the first special needs school in District 2, possibly in HCMC, why did you feel it was time to open STEPS now? I saw there was a need because provisions for children with special educational needs and disabilities are poor in Vietnam. I’ve been in Vietnam for 13 years and have also volunteered at orphanages that cater to children with special needs and have seen children rejected by a school because they don’t have the resources for them or they don’t have a specialist to help those children. What happened is that the children stay at home without receiving help and the parents was in pain knowing that their child does not have a place to grow and enhance their skills. Can you explain the education programs and curriculum the school uses in its classroom? At STEPS we base our curriculum foundations on the Montessori model and have strong links with Wonderkids Montessori. As we are a specialized school for children with special educational needs, we tailor and adapt our curriculum accordingly to suit the needs of our children. At STEPS we have the knowledge to strip education and learning to its core, with the knowledge and experience from our lead teachers we believe in developing awareness in new skills needed for learning, once new skills are introduced we can then teach to ensure students master the required new skills and prepare them for adulthood in various settings that student will be suited for. We also have native Vietnamese speakers to support local students. Our partnership with Wonderkids Montessori School will create a possibility for our students to be integrated to a regular education setting. Our close partnership developed as we have supported several students who currently attend this school. We also work closely with the staff at Wonderkids to promote an inclusive education for all students. With the potential for several types of special needs in the same class (dyslexia, autism, Asperger’s, etc…). How does STEPS addresses each individually at the school and in the classroom? The students need an assessment from a clinical psychologist, pediatrician or any ancillary services. We will proceed to complete our own observation report to know their strengths and weaknesses. We will then consolidate this information and work closely with the parents to develop Individualized Education Plans. After a close discussion with the parents and our team, we will then place them in a class best suited for their needs. Tell us about the teaching staff. Our teachers are well-trained and experienced educators for children with special needs. They have been teaching for many years in specialized education, they also passed the licensure examination, have double degrees, and have a Masters in Special Education. Some of our staff are trained in various communication aides and strategies such as sign language, picture exchange communication and applied behavior analysis so they can be of help to those children who are non–verbal or have limited communication, including behavior difficulties. Working with special needs students can present a challenge such as behavioral issues, besides the teachers and education faculty, are the other staff (security guards, cleaners, etc.) also trained to properly interact with the students? Our school prides itself in streamlined communication amongst its staff. All staff interact and have regular contact with students to create a positive learning environment. The staff are regularly trained on site by our professional team. We also have behavior policies to ensure we are all following the correct procedures and strategies. 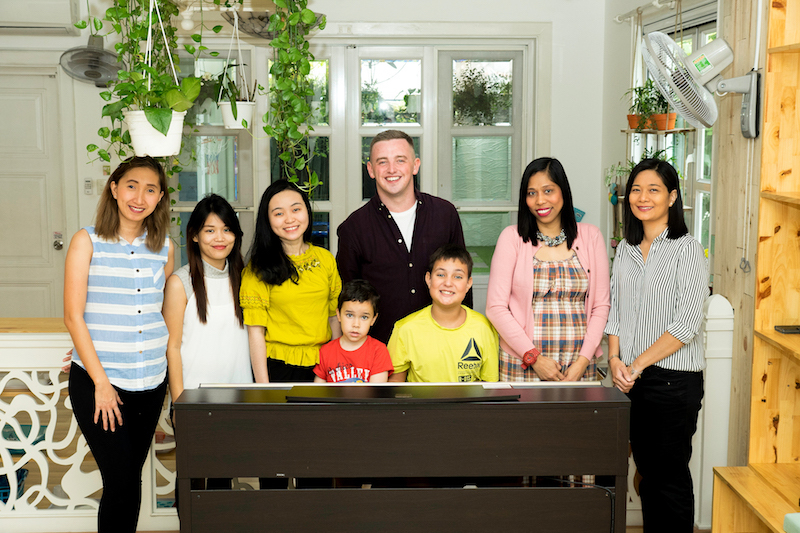 The importance of family cannot be understated or underestimated in Vietnamese culture. The family is regarded as a fundamental unit of respect and cohesion. Therefore, the good of the family takes precedence over an individual’s welfare. In this context, a child or person with special needs or learning disability is regarded as marks of shame for the family, so they are commonly hidden at home in order to prevent familial disgrace. What’s your opinion on this and how can STEPS help bring awareness that having special needs is not a stigma and with support and the right help, children can thrive? STEPS has struggled to reach out to some parents due to the cultural awareness and beliefs around special educational needs and disabilities. As a school, we believe we are pillars of support for the community. Unfortunately, we are aware that we cannot change the stigma around disabilities and special needs in Vietnam overnight. However, what we want to do is to educate people to break down barriers for children so they can integrate into the community and get the education they deserve for the life that they want. At STEPS we want to reach out to neighboring communities, charities and schools to work together, and regularly organize events to raise awareness about special needs and disabilities. To learn more about STEPS, visit www.steps.edu.vn or 18A Vo Truong Toan, D2.